I began obsessing over mommy necklaces during my pregnancy. There are so many options and I needed to find the perfect one. I debated between initial necklaces, bar necklaces, birthstones, etc. Then I came across Jenny Present, which allowed me to combine everything I wanted into one necklace. 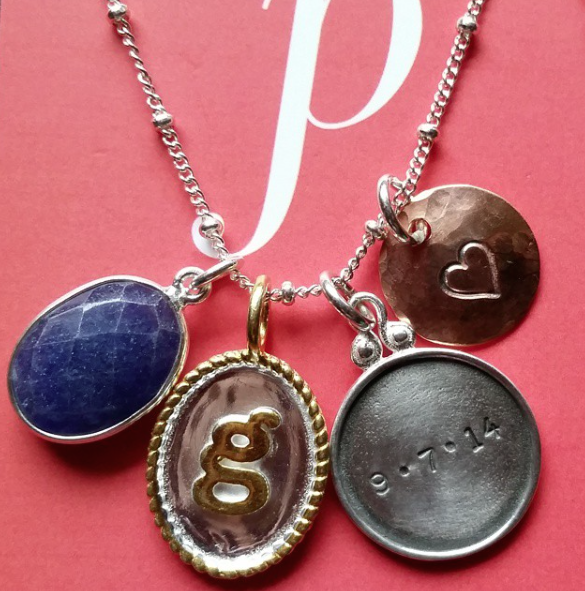 I chose the charms above: a sapphire for my daughter’s September birthday, her first initial, birthdate, and a copper heart for cuteness. I wanted to write my daughter’s full name– Genevieve– but there weren’t many charm options that could accommodate a longer name. I love my necklace and wear it every day. It allows me to have a little reminder of my baby while I’m at the office. I plan on making more necklaces, too. One for my dogs, which will include a bone charm, and one to commemorate my wedding. This website is too fun. It’s an accessory lovers paradise. Collect charms like tattoos. Sign up for the email newsletter and you’ll get weekly discount deals. I used to hint to my husband that I wanted a mommy necklace as a push present. He rolled his eyes. I guess it worked out that I made my own since I got a C-section anyway! Next PostHappy National Dog Day!